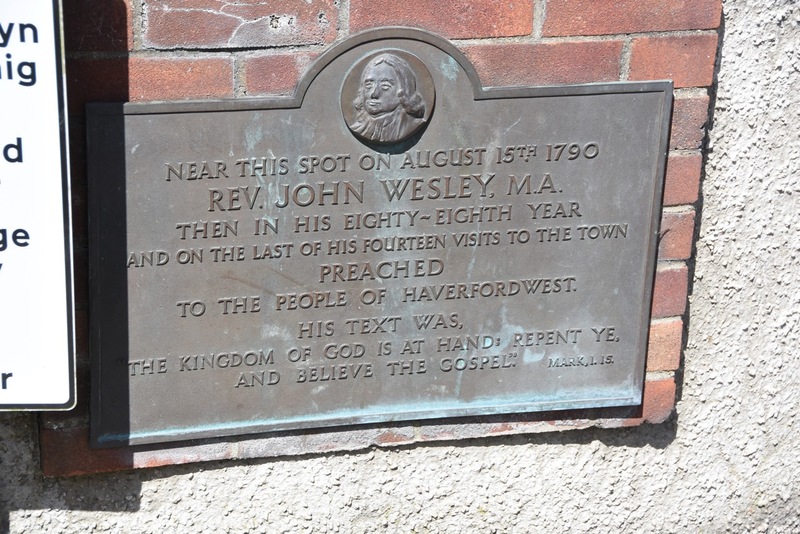 Recently, while on holiday in Pembrokeshire, I passed a plaque in the town of Haverfordwest dedicated to the memory of the pioneer Methodist evangelist, John Wesley. My family and I have been on holiday in this area each year for over 30 years so I must have passed it many times, but in 2017 I noticed it for the first time . Easy to miss; perhaps easier to miss than John Wesley would have been in 1790! The early Methodists were called enthusiasts, a derogatory term in their day. I have used the word to represent the sort of person whose Christian beliefs are infectious, so that they pass it on to another person, some of whom also become enthusiasts. Religion then spreads like a disease, typical of church growth in times of revival. If the church in the UK is to stop its current decline and grow again then it needs revival, and it needs enthusiasts of the sort in Wesley’s day. It made me think what sort of lessons we can learn from his day that would help the contemporary church. The effect of the Reformation and the Puritans was long gone. The Christian religion was mocked by rich and poor alike, whose preference was for entertainment and alcohol. In many ways the time was similar to 21st century Britain – Christianity looked as if it was on the way out. Wesley was not daunted by the situation – he, and the other Methodists, saw it as a great opportunity to spread the gospel and glorify God. Enthusiasts do not look at the situation, but to the God who has commissioned them to make disciples despite the situation. 21st Century secular Britain is a great opportunity for enthusiasts! Wesley never stopped preaching, he never retired. This was his 88th year and he still saw it as his mission to convert the lost and build the Methodist societies. He travelled extensively. Before his final tour of Pembrokeshire in August 1790 he had travelled from Lincolnshire, and afterwards visited Bristol. [2,4]. Enthusiasts have a zeal for the work of the gospel that need not waver with age, health or the passage of time. The UK church has many former enthusiasts from the evangelical and charismatic renewal of the late 20th century who have given up the fight and fallen asleep spiritually. The lesson of Wesley is that they can be enthusiasts again and spread revival until their last breath. Wesley was preaching in Wales, at this time predominately Welsh speaking. His normal practice of preaching to the poor and uneducated could not be used as they could not speak English, the only language Wesley could use . Fortunately there was a separate Welsh speaking Methodist connection that ministered to the poor in Wales. Wesley, not put off by the culture, changed his strategy. Instead of preaching directly to the poor he preached in places like Haverfordwest where there were a number of wealthy families, who could speak both English and Welsh. He then inspired them to teach the poor, especially the children, and bring them to faith. One member of the Haverfordwest church was a Miss Catherine Warren, a member of the local gentry who Wesley corresponded with regularly to encourage her in her work . Wesley expected conversions from all levels of society, culture or class were no handicap. All were expected to change, rich and poor alike. Then culture changed accordingly. Enthusiasts are not put off by the culture of society. Whether it’s atheists, humanists, Muslims, or “Diversity” and LGBT ideologies, enthusiasts expect conversions that change behaviour and lead to cultural changes that reflect God’s kingdom. Wesley’s text that day was “repent and believe the gospel”, one he had no doubt preached many times. His message was simple and direct, sin is the problem, Jesus is the answer. His was no message of acceptance and inclusion, popular in much of today’s church, but of one of justification and transformation. No one had to stay the way they were – through repentance and faith they could be put right with God immediately, and become what He designed them to be. Enthusiasts preach directly to the heart of the problem. Wesley preached. He was not a social activist, though he did much social good. He did not organise discussions or debates, perhaps where a group of people could decide what is true. Though no doubt his preaching left many people discussing and debating! He preached, that is he took a text explained, it and persuading people to obey is implications. He did not do it to be popular. Preaching was no more popular in his day than in ours; Wesley was sometimes stoned and often verbally abused. He preached because Jesus commanded it. Enthusiasts obey the command and preach. Wesley preached everywhere. He did not wait for people to come, but went to them. Enthusiasts are not locked away in church buildings, but out and about, speaking to people whether ones and twos, or in crowds. Wesley preached the Bible; he had confidence in its message and in the truth of its words. Recently I was at a church where the minister read out some words of Jesus from Matthew’s gospel ,“And if he refuses to listen even to the church, let him be to you as a Gentile and a tax collector”. The minister then said, “This couldn’t have been the words of Jesus. Something must have got lost in translation between him and Matthew!” Sadly that lack of confidence in scripture has been common in the church for a few generations and has undoubtedly assisted its decline . Enthusiasts have confidence in the truth of scripture, so much that they live by it, and must bring it to the attention of all they meet. If Wesley was around today, it is not clear what he would have made of a plaque in his name. But he would have recognised society, the plight of sinners, and the state of the church. No doubt he would still be an enthusiast and behaved exactly as that day in Haverfordwest. Today’s enthusiasts need only to follow his example. 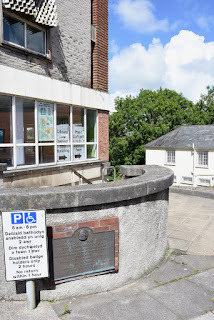 The plaque was unveiled on the 18th May 1956 at the town’s grammar school. It was later moved to the town’s library, date not known. As a result of the 18th revivals started by the Methodist, all the UK Christian denominations experienced revival in the first half of the 19th century. Thus, in the 50 years following Wesley’s 1781 visit to St David’s, the Cathedral was rebuilt by a now flourishing congregation, as were most of the decaying parish churches in Britain. Of course there was revival and church growth among the Methodists from the 1730s onwards. But it took to the end of the century before it spilled over into the other denominations in a big enough way to repair the damage of their long period of decline and neglect. 5 Prayed, letters ; 8 tea, conversed, letter, chaise ; 10 St. Daniel's, prayer, Acts xi. 36 ! meditated ; 1 1 Rowl[ ], communion ; 12.30 writ narrative, dinner ; 3 [ ], boat, chaise, Hav[erfor]d ; 5 tea ; 5.30 read, Mark i. 15 ! the bands, visited, supper, prayer; 9.15. 4 Tea, conversed, prayer ; 5 chaise ; 8.30 Tavernsp[ite], tea ; 9.30 chaise, prayed; 12.30 Carm[arthen] ; i at T. Taylor's, writ narrative, dinner, the preachers, letters ; 4 Isai. xxxv. 8 ! on business ; 7.30 supper, conversed, prayer ; 9.30 lay down ; 11.30 sleep. The square bracketed letters indicate missing letters from his abbreviated diary entries. In some cases the missing letters cannot be determined, hence [ ]. He actually preached in Haverfordwest on Sunday August 15th. He left the town on the 16th. Thus the plaque records his last day in the town, rather than the day he preached. See also “John Wesley in the Cardiff Area - Part 2: 1747-1790” by David Pike for extensive material on Wesley’s time in Wales. There was no Wesleyan Methodist church in Haverfordwest in 1769. But by 1782 it was established and thriving, mainly due to the enthusiasm of Miss Warren. Bulletin of the Wesley Historical Society in Wales, Number 1, P76, 2011. See the series of articles on church growth and decline on the Presbyterian Church of Wales as illustrative of the post 19th century decline of the church. This decline is attributed to a fall in conversions, caused by a lack of revival, rooted in a mixture of institutionalism, rationalism and liberalism, which undermined the church’s confidence in Scripture and the God who reveals himself through it. - Churches are desperate for money; do they want intelligent members who deliberately impoverish themselves? - Some argue that evangelism today has to be friendship-based rather than preaching-based. Thank you for your comments, which were really helpful. I have put my response in a new blog post.